The Boone County Fire Protection District is a high-turnover volunteer fire district with many college-age participants who agree to be on call for about 40 hours a week in exchange for a bunk in a firehouse. Trainees normally go through an extended training before they are qualified for such a position, however during the summer of 2017 enough applicants had time to condense the multi-month part-time training into a one month morning-to-night marathon. I followed two of the trainees through the program writing about, and photographing, them for the Columbia Missourian. 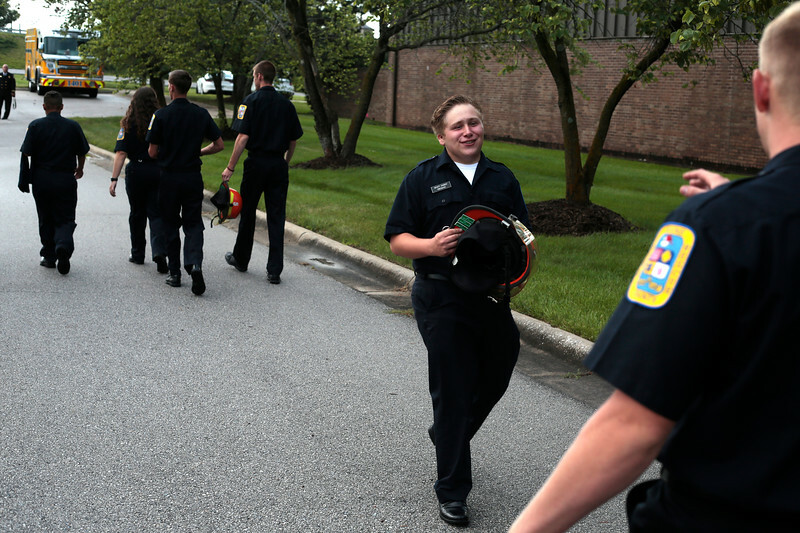 Wyatt Dawdy jokes with other recruits as they walk out to the hazmat truck to take graduation photos on June 29 at the Fire District main offices. The nine-recruit class was very tight-knit after spending a month training together from 8 a.m. to 5 p.m. five days a week.